Adding a horse walker or treadmill to your farm can help you increase the health and vitality of your horse, as this is dependent on how much the horse moves. Movement creates good circulation and promotes healthy growth for horses. The addition of a horse walker or treadmill to your farm balances out movement deficits your horse may be experiencing. Contact us today to add a horse walker or treadmill to your farm. At Amberway Equine Solutions we pride ourselves on providing the finest horse training and exercise equipment available. Whether you are in search of a horse walker or any of the other accessories we have to offer, we are here to set you up for success. There are various fence styles and control systems available for ground standing horse walkers. They are designed for 4 – 10 horses and have a diameter of 39′ to 131′ (12 – 40 m). 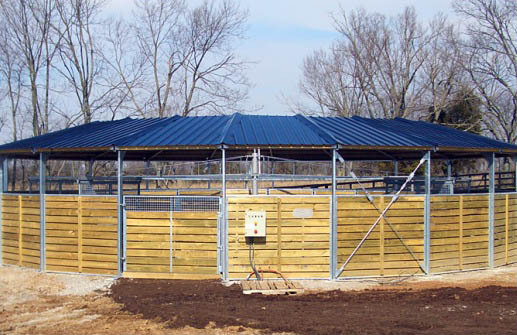 Ground standing horse walkers (round) with partial roofs protect horses against the wind and rain; the walkers can therefore be used throughout the year. 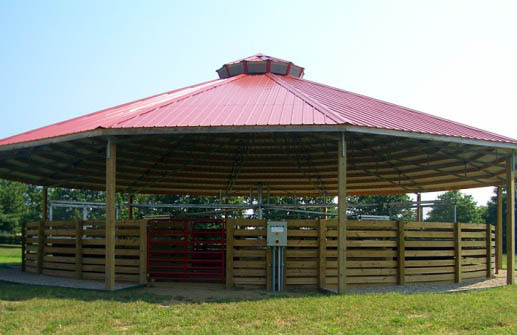 They are designed for 4 – 10 horses and have a diameter of 39′ to 131′ (12 – 40). Industrial belt drive, low maintenance and quiet. Simple operation, with sturdy construction and very high safety standards. All products can be custom designed according to client needs. Optional self-installation available. 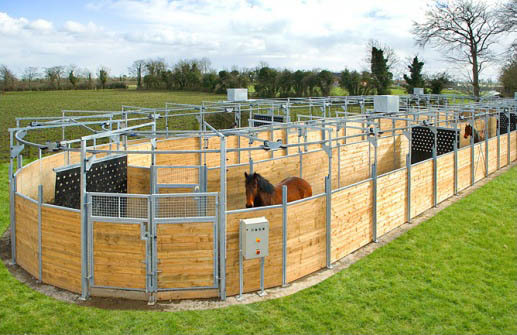 Ceiling-mounted horse walkers have a very spacious interior which can be used very well for lunging purposes. 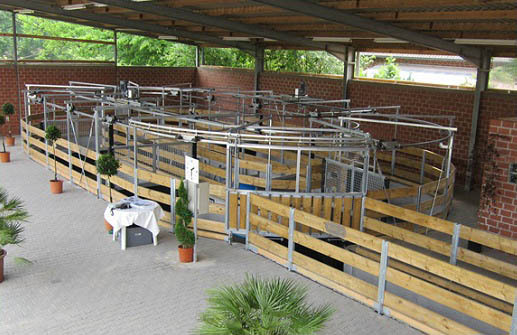 They are designed for 4 – 10 horses and have a diameter of 39′ to 131′ (12 – 40 m). Sample of Fence Varieties: The inner and outer fences are very important to each horse walker, they can also affect the safety of both horse and rider. The Ceiling Mounted Walker with Lunging Ring is designed to be a round fence structure with 12 columns and an inner and outer fence with 24-sides. 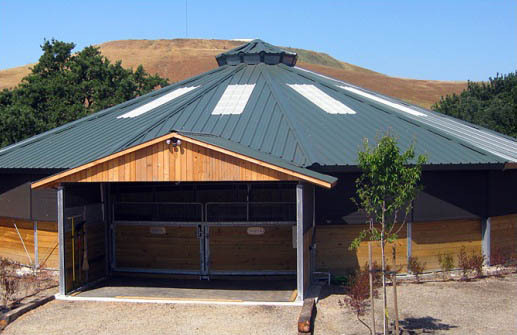 Rail-gliding horse walkers can be manufactured to any size desired and can be fitted out with a partial roof. This product can be installed into an existing building, saving foundation and roofing costs. Once constructed the Rail-Gliding Horse Walker is easy to use and has high safety standards. This horse walker also allows for new variations in the pattern of the walking track, it can include curved as well as straightaway sections, giving a more natural training for horses. Water horse walkers, System Voncini, were developed to warm up horses, to build up and relax muscles at the same time, and to achieve optimal rehabilitation results. Horses do not swim but tread water and move freely within the corridor with the added benefit of being able to change directions. The computerized control panel allows one to program the rhythm of the pace and reverse directions at preset intervals. An automatic safety device stops the rotation of the horse walker if the need arises.